The recitation of Kaddish benefits both the soul of the departed loved one, as well as the mourner. For nearly the past eleven months, I’ve been attending synagogue quite regularly, in order to say Kaddish for my late mother, Leah Zelda bat Yaakov Zeev Halayvi v’Rivka. I once attended a presentation by Ari Goldman who spoke about his memoir,Living a Year of Kaddish, in which he describes some of the people he met and the experiences he had, throughout his year of mourning for his father. I was profoundly moved by the presentation and promptly read his book. I began to think of what it might be like for me to record some of my Kaddish experiences when my time comes. I had already decided that, while I hoped it wouldn’t happen until her 120th birthday, I would take it upon myself to say Kaddish for my mom. When my dad died, 19 years ago, we had three young children, I was working full time and, in the community where I lived, women just didn’t say Kaddish. Although my mother never asked me to recite Kaddish for her, it was something I wanted to do for me and for her. I viewed it as an opportunity to grow in my spirituality. You know, the recitation of Kaddish benefits both the soul of the departed loved one, as well as the mourner. After someone has died he or she can no longer get credit for performing mitzvot in this world; but those who survive them can perform mitzvot for the elevation of their soul. The Kaddish prayer is one in which we affirm our belief and connection to God. Especially when someone is in mourning, it can be a comfort to remind oneself that HaShem is with them, even during this challenging time. Also, by having a structured daily time to think about my mom and reflect on the loss, it helped me in processing this journey. I am the kind of person who best deals with my emotions by confronting them and expressing them, rather than suppressing them. Saying Kaddish enabled me, on a daily basis, to connect with the new type of presence Mom has in my life. Often when I’d be saying Kaddish, I’d visualize one of my favorite photos of her. She’s standing on the beach, wearing a broad smile. Now, I’ll let you in on a secret. Earlier in the year, when I’d visualize that photo, it would be straight ahead of me, in my mind’s eye. As the months have gone by, that image has risen further up. To me, this is a sign that her soul is experiencing that elevation that I spoke of earlier. I sure hope so. When my week of shiva ended, I had a conversation with Laura Frank, a knowledgeable friend, about some of the practices around women saying Kaddish. She said that many women who choose to say Kaddish, usually do so just once a day. Laura also pointed out that, if I attended synagogue for Mincha and Ma’ariv services, it would technically count as two days. For example, attending on a Wednesday, Mincha would be part of Wednesday’s prayers while Ma’ariv would be part of Thursday’s prayers. Now, my beloved mom was a smart shopper and always taught me to look for bargains. So, two for the price of one was a deal I couldn’t pass up. I’d also arranged with the rabbi from Mom’s synagogue in Miami to have someone in their minyan recite Kaddish daily for her. That way, I felt, there was always a backup for me, if or when I wasn’t able to get to synagogue. When you’re not used to attending synagogue on a daily basis, there are many things to adjust to. Did you know that the pace of the daily services is a lot faster than on Shabbat morning? And most of the prayers are not said aloud or in unison? I had to find my comfort zone with which prayers I would say in their entirety and which I would skip, simply because I just couldn’t keep up, and yet I wanted to have a meaningful prayer experience. It was also quite an educational journey…. to go to synagogue daily for a year, and to become more aware of the variations in our prayers during this annual cycle. It was interesting to have to adjust my daily and weekly schedule according to the time of the setting of the sun, which, as you know, varies throughout the year. It’s pretty cool to have that element of nature govern the schedule of your busy day. It’s amazing to look back and realize the very many things I learned in the course of my year of reciting Kaddish. 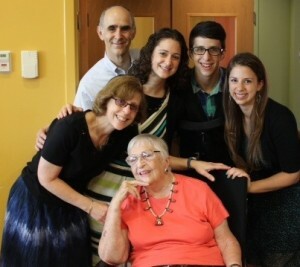 This post was adapted from a d’var torah Mindy delivered at Congregation Netivot Shalom in Baltimore, MD on May 31, 2014, just prior to the conclusion of the Kaddish year for her departed mother. Part two will be published next week. The prayer does not praise (or even name) God. Here’s why. Every Tuesday for a year, we came together — for a memorial service, yes, but also to experience Jewish community in a new way. Two moving renditions of Yizkor to recite in addition to, or in place of the traditional Yizkor prayer.